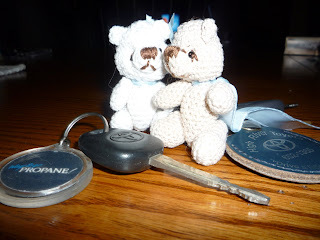 My dear friend, Linda, made me these two little Thread Bears. They are done in crochet and are fully articulated - all the joints move and the heads turn. Would you look at the size of them though next to my car keys? They are just the dearest little things - I love them! Thank you Linda!! Well, here I am with three more dishclothes done this week. These are all done with different patterns but the unifying theme for all is hearts. These will be popped in the mail today as a little Valentines Day gift for my brother. I am going to try very hard to force myself out of my dishcloth obsession by knitting a scarf or shawl next. 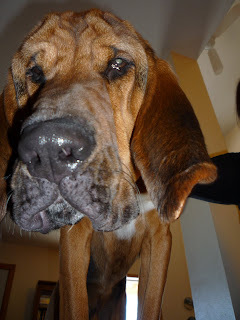 This is Duke, dd's bloodhound. He is still a pup, under a year, but I have been fascinated with how the characteristic bloodhound folds have been developing in his face. Which is why a while ago I found myself lying on the floor taking this picture upwards as he looked down at me from an armchair. This is the first bloodhound we have had in the family but I don't think he will be the last. He has a wonderful personality and I'm sure I will appreciate it even more when he gets over the puppy chewing stage. So far he has eaten numerous shoes, a cell phone, a loveseat, etc. 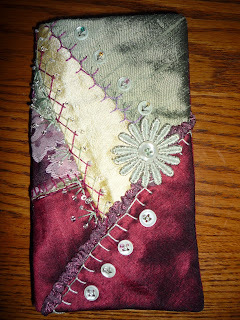 Just last night it was my new dental floss and a piece of crazy quilting recently completed. Don't let that deter you though, he is fearcely loyal, intelligent, playful and very loving. So, that's the story! Now on to the six blogs I am tagging in return. 1. On Leslie Ehrlich's Pinyon Creek Stitchin' you can see details of the three Making Memories Quilts she is putting together. These quilts are crazy quilted and have been constructed using bridal fabrics - they are truly glorious. More closeups of these quilts which have been made to benefit breast cancer are available at Leslie's Flickr site, along with many other photos of her glorious crazy quilting! 2. At Thelma's Hand Dyes you can follow her journey with colour, as she creates wonderful fabrics with the art of dyeing. These works of art would be so wonderful to use in some crazy quilting. It's a good thing I'll never get a chance to see Thelma's studio - I would be tempted to go in there with my scissors... just a snip her and a snip there! 3. Linda Boudreau's Threads of Love - Besides being one of my all time favourite people, Linda is an extremely generous and prolific stitcher. I have been blessed with several wonderful surprises from Linda and they are all treasures. Right now Linda seems to be dividing her time between knitting socks and dishclothes, crocheting the tiniest little Thread Bears (imagine a crochet bear only two inches tall!) and making wheelchair bags and bean bags to gift to the local nursing home. Linda's All That Jazz block for the Katrina quilts is one of my all time favourite pieces of crazy quilting. 4. Lyn's Quilting Lion is another favourite of mine. Lyn does beautiful crazy quilting. 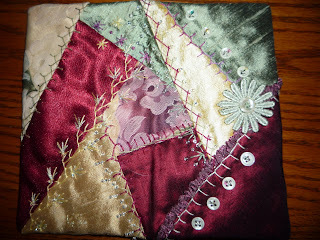 You will also find a wonderful tutorial on her blog of how to make a crazy quilted pinkeeper from old compact discs. Be careful though... they are addictive! 5. 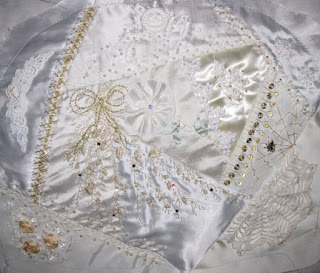 I love to visit Judy's blog, CJ Stitching and Blooms, and watch the progress of her project, "Crazy Quilt of my Dreams", as well as other things she has going. Judy's blog was recently beautified by her friend, Heather, from Saskatchewan, Canada. Nice to have friends with such great talent in graphic art! 6. You may have noticed there were two blogs in #5 - I wanted to mention another here that I won't contact to play this little game. I do, however, want to point the way to the Crazy Quilting International blog. Such a feast for the eyes!! This is tonight's dishcloth. 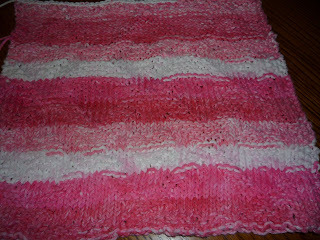 The pattern is called Honeycomb but it almost disappears because of the yarn I used. This is Bernat Handicrafter in a line called Stripes and I really liked the way the varigation worked up. 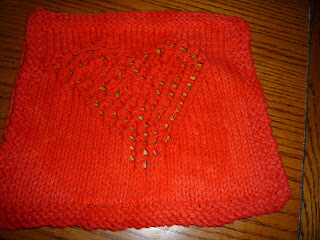 I am justifying knitting more dishcloths because I decided I should send my brother three for Valentines Day. With the pinks in this yarn I thought it fit with that theme. One done, two to go! 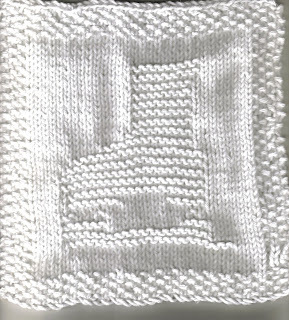 I did up this dishcloth last night - it seemed appropriate to be doing it while watching Hockey Night in Canada on tv. Now I think I need to design one with the logo from my favourite team! I couldn't resist changing the header on my blog when I got this block back! Thank you to Bonnie, Candi, Clairee, Meg and Jeanne who all did work on this for me. It was a round robin block for the On the Seamy Side Round Robin at CQI. 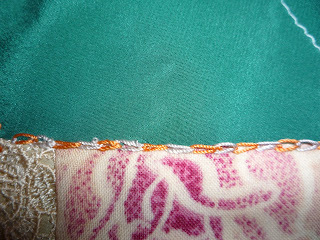 We had specific stitches we had to use each go around so it was great practice on seams. I made this block up as the front of a tea cozy I am going to make and keep for myself. It was done in bridal fabrics and all the stitching and embellishments are whites, creams and gold. Isn't it pretty? Now I need to get the back done so I can put it together. 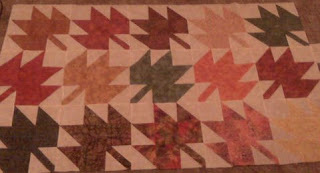 This is the latest quilt top to come to me in the Row Robin I am in. I added the third row of blocks at the bottom. This one is all done in Christmas prints and it is very entertaining to sit and look at all the cute prints. It is an easy block to make with 2-1/2" strips - I think I'll have to make one for myself one of these days! It all started before Christmas when I was visiting my son at his place. 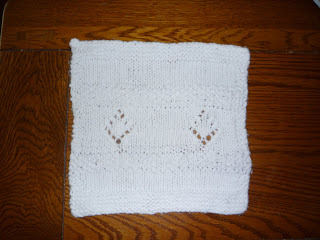 I did the "Mom-ly" thing and did the dishes while I was there and noticed they could use some dishcloths. So I decided to knit them some... Dozens of dishcloths later I still can't stop! 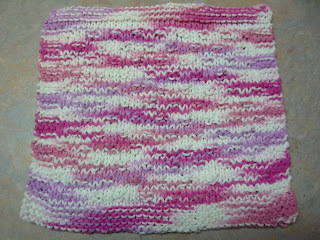 lol My friend, Jackie, told me about a Yahoo group called "Monthly Dishcloths" and now I have a support group for my obsession. Twice a month they post a "mystery": that is, a pattern where you don't know what the end result will be. The pattern is posted gradually over the course of a week or so and what it will look like in the end is a surprise. 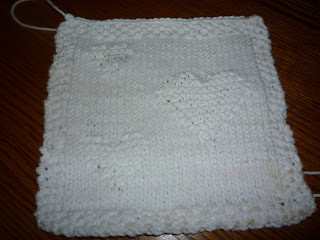 This picture is of the mid-January dishcloth, which I have just completed. 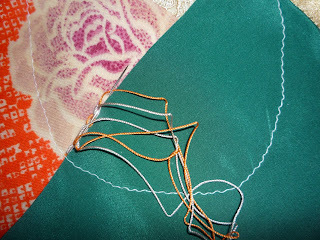 Nancy has put some of her Build a Seam Challenge samples into an album. They are great! My favourite is the circles with the roses! I was moving pictures around to accomodate some new ones received at Christmas, and I thought I would take a photo of this one to share. First off, I can not claim this piece - I did not make it. Wish I had, and moose hair tufting is on my list of things I would like to try sometime. This was made by a First Nations lady in northern Alberta and I was lucky enough to receive it as a gift. For centuries the Cree people of Northern Alberta and the Inuit of the Canadian Territories used Moose Hair Tufting as the main method of embellishing their clothing. Moose and cariboo hair tufting is one of the most beautiful crafts indigenous to the Aboriginal people of these areas. This art requires a lot of patience and skill. It was once a disappearing art form but happily is now experiencing a revival among Aboriginal people. To create these pictures, a small bundle of hair is cut off and a stitch is made around the hair and pulled tight so that the hair stand up in a tuft. The hair is then sculpted with scissors to create these beautiful pictures. Florals are a favourite design and if you would like to see some better pictures you can visit the site of The Arctic Trading Company and see pieces they have for sale. If you click on the pictures you can see good close ups that give you an idea of the work involved in creating these. I apologize for the quality of the picture I am showing - the glare of the glass got the better of my camera skills. 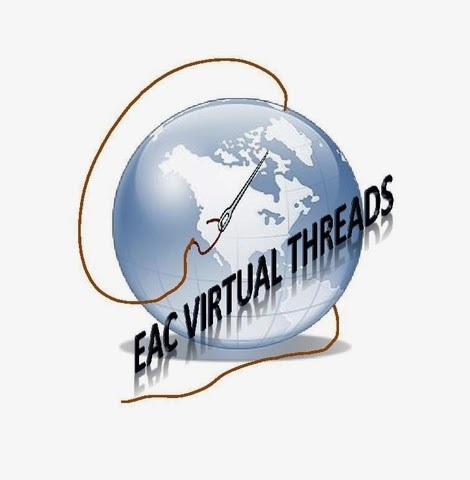 If you are still interested in learning more you can visit the Virtual Museum of Metis History and Culture and view a short video interview of Richard Lafferty Jr. titled On the Origins of Moose Hair Tufting. The video shows several really beautiful examples of the art form. These two photos are the side view and the view from above of a little pincushion I made for my Secret Sister on one of the quilting groups. 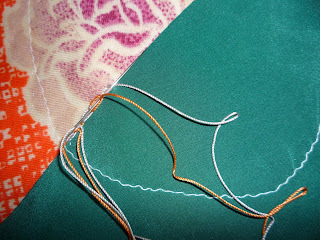 This particular group focuses on "sane" quilting (as opposed to crazy quilting) on a budget. The budget for the secret sister gifts are $10 for the whole year so a little ingenuity is called for. 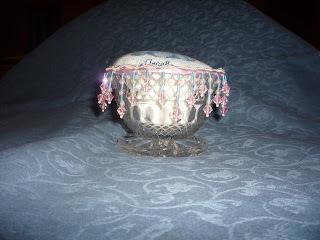 The little crystal dessert dish I picked up at the thrift store for about a quarter and the embroidery itself from the same store. It was framed in an embroidery hoop (remember when everyone was doing that?) so I took it out and constructed a giant yoyo out of the cross stitch and some fabric from a remnant and then stuffed it. The beaded trim and rose trim both came out of my stash so I don't count them. So, all in all, I figure it cost about fifty cents to make. I hope she likes it! So, why get involved in Secret Sister Swaps? Just for the fun of it! It is fun to pick and choose and try to make or find little gifts to please someone else and hopefully brighten their day. It is also fun to receive little thoughtful packages in the mail from someone else. It makes a nice change from the bills that usually land in our mail boxes. It is another way to meet other people and get to know them a bit better. Often these swaps result in lasting friendships and that is always worthwhile! 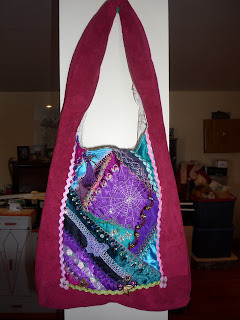 Well here it is at last - my In the Bag swap purse finished and in the mail! I finally had to shut down the computer for a few days to get enough stitching time to finish but I feel so much better now this and several other projects have been caught up. 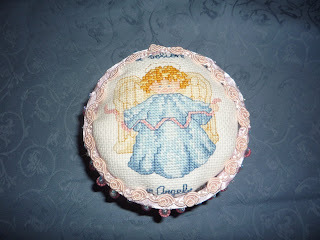 The purse was made from a pattern in one of the Australian stitching magazines I have had for a few years. 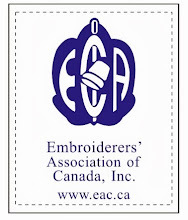 For anyone not familiar with the In the Bag challenge - the group exists for one swap yearly in which the participants each put together a package of fabrics and embellishments. They are swapped out and the challenge is to make something (this year, a purse or bag specifically) and return it to the original owner along with any leftovers. It is always difficult for me to work with someone else's choices and this year was no exception! Therein lies the challenge. The ric rac was especially hard but finally found its place. Using the baggie contents, I made a crazy quilted panel for the front of the bag. I dithered quite awhile about the balance of the bag but finally decided on using some pink ultrasuede I had in the stash. The lining is a nylon/polyester blend but has the appearance of an embellished dupioni, or close enough. In the end I am pleased with the results and happy to finally have it on its way. 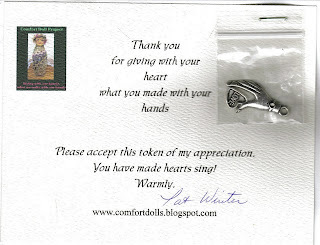 I recently received this gracious and eloquent card in the mail from Pat Winter together with the little heart & hand charm. This little charm has been sitting by my computer making me smile ever since. I will treasure this as a reminder that we are able to make a difference in the world, a little bit at a time with our hearts and the work of our hands. Thank you Pat! Just when I thought Christmas was over for the year I received a package from my Secret Sister at CQI. Not a secret any longer though so I am now able to thank Karen South personally for her generosity. Besides a wonderful fat package of silks, trims, buttons and beads there was a present to open. Even the wrapping was special - wrapped in dupioni and tied with silk ribbon! Now don't you wish everyone wrapped your gifts like that at Christmas!? 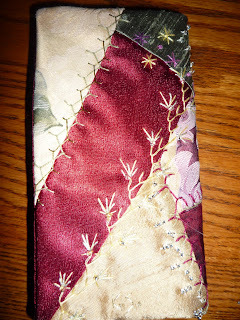 Inside was this beautiful needlebook which Karen made just for me. (Thank you again, Karen!) The photo above is the front of the needlecase. Such gorgeous, rich fabrics and colours and really nice use of beads to add a sparkle. 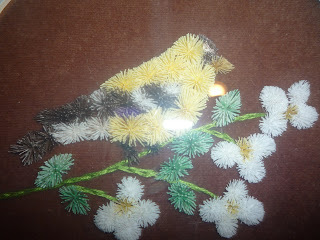 Check out the buttons and see how each is attached with a little embroidered and beaded flower - very neat! Below is a picture of the back of the needlecase. You can always tell when I really like something because I just can't stop taking pictures of it! lol So below is one of the needlebook opened so you can see the whole block it was constructed from. Always a nice vantage point, right? And, last but not least, I have to show off the inside because there is a feature Karen added that I just love. 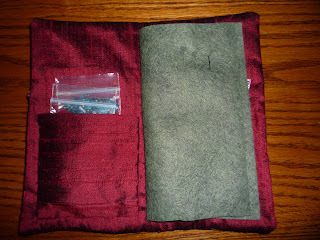 On the inside of the front and back cover she has added little pockets just perfect for a package or two of needles. Or, since I think this will become my needlebook just for my beading needles (which I am always losing) it will be great to tuck a little package of beads in there! 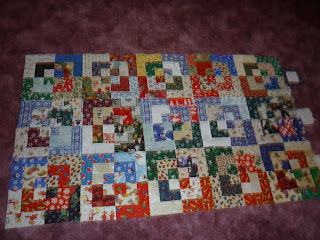 Teresa was kind enough to send me a picture of how my Row by Row Robin quilt top is coming along. Isn't it looking great? So far there are the rows done my Cathy, Teresa and myself. All the maple leaves are done in batiks and I know I will love it even more when it is done its travels and gets back home here. My tentative plan is to do this quilt up for my husband's parents - they live in Quebec with all the beautiful fall colours so it seems very appropriate. I wish I could see it in person right now but I will have to be patient awhile longer. I would like to wish everyone the happiest of New Year - all the best of everything! I am feeling very positive about this upcoming year - I think it will be the best yet! Yes, I know, all the predictions are all doom and gloom and everyone is concerned about the financial situation. I don't feel that way though - I am sure that in spite of all that it will be a wonderful year. It might be a year of belt tightening but what better way to get creative? 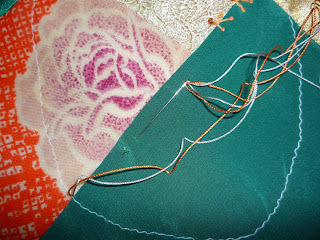 Leftovers, patchwork, crazy quilting - all ways of making the most of what we have in our scraps! Yesterday, the horse seemed to be mirroring my own feelings about the new year. She was rolling in the snow like a young filly on a hot summer day! 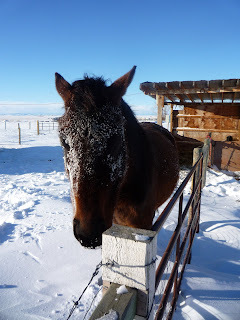 I'm sharing a picture of her here with her face covered with snow after her antics. So, the horse and I have the same advice for this year: roll around for the pure joy of it, dance like no one is watching and sing out loud! 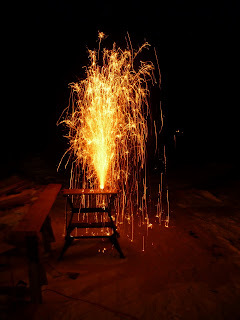 This other picture is one of the fireworks we let off at my house at midnight last night. They are nothing compared to the huge displays in the cities on New Years Eve but to us country folk living out in the boonies they are exciting enough to bring the neighbour kids over to watch! So, that is my other new years advice while I am waxing philosophical. Don't look too far for your joy or expect it to be too big. I think that leads to disappointment inevitably. Look to your own life and within yourself for your joy - find it in the small things! If you wait for the big events to be happy you waste too much time waiting. Well, those are my deep thoughts for the day. I am off now to work on my resolutions for the year. They will doubtless have a lot more to do with stitching!